My stealth project is no longer a secret. I've built several automated Flash systems over the years (starting with Flash 4 and Applescript), but this is my first "real" desktop version. It's available for OS X 10.3 or higher. Thanks to Andrew DeVigal at Interactive Narratives for the kind review. On a personal note. If you ever wanted to know what I did before journalism, this is it. I played the vibes. And I still do to this day. Sound in the Story (pdf) by J. Carl Ganter and Eileen E Ganter is my favorite audio tutorial. Storm and Seida's A Practical Guide is a close second. Videos by Travis Fox with design by Nelson Hsu, text edited by Jeffrey Marcus. Also of note, this feature video is currently embedded on the cover of the washpost. 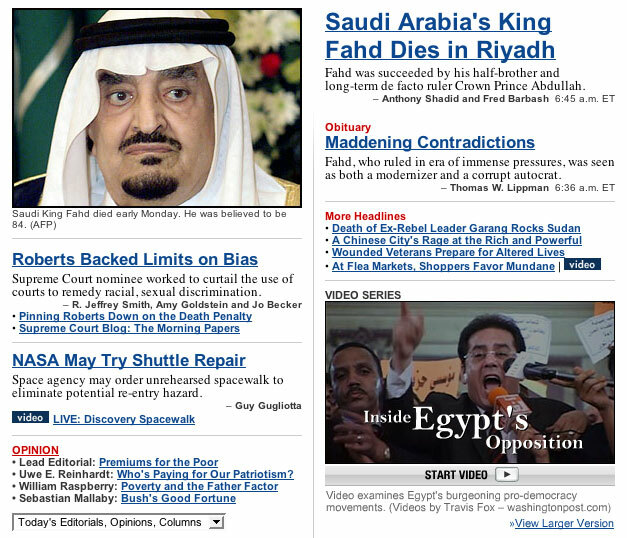 Here's a screenshot, as news will surely overtake the feature's display position. I finally got my hands on a Marantz PMD660 this weekend, and I have to say that I'm not as impressed as I thought I would be. This may only be a case of extremely high expectations. The form factor isn't quite small enough to call compact, but it's still about half the size of the PMD670 that I currently use at work. Now, I should mention that I rarely gather photos and audio at the same time anymore, so the added bulk of the 670 hasn't been an issue. The 660 is a bit noisy when used with dynamic mics (as mentioned in transom), but since I only use powered condenser mics, this isn't a problem. I tested with a dynamic (EV 635N/D-B), a short shotgun condenser (AT-835b) and a stereo condenser (Shure VP-88). I used phantom power with the Shure and it sounded great. The 670 does have a much more intuitive menu system, and many more recording format options. The 660 is limited to PCM (wav files) at 44.1khz or 48khz, or MP3 files at 128 kbps stereo or 64 kbps mono. Now, which would I buy if I didn't already have access to both? I'd go with the 660, which is $200 cheaper and half the size. But the geek in me is happy to have the choice. I don't like the preset recording options, which isn't a big deal since I could save my own. The door to the flash card slot will not survive general pool use in a photo department. I'd recommend using the supplied screw to lock a 2 gig card in the recorder. Then your team can use the USB cable to transfer the audio to the computer without ripping the plastic door off. The meter lights on the 660 are much better than the 670's LCD meter. This is the one thing other than size that I prefer on the 660. Since the XLR inputs are on the bottom of the recorder, it doesn't work very well in your camera bag. "I do wish it was made of something stronger than plastic, if this thing drops from waist level it will not survive the fall. The manual is somewhat easy to understand. When I got it I had one day to test it out before the start of my project. I wanted to just hit record and get it done, but I had to set up my custom functions before recording. When using the minidisk and it was on I could hear everything, when using the 660 I only hear it when it is in the record mode." "We have only 2 minor complaints. The headphone jack is in the front and the XLRs are in the back. This makes it hard to have sticking out of a bag as the connectors are on opposite ends. also the unit does not mute the speaker when you are recording, this can cause feedback while you are recording unless you turn down the volume or plug in your headphones. Of course you should always be wearing your headphones when you are recording anyway right?" "Sound quality is super, much better than my minidisc. My complaints so far are few - mostly in the layout of the buttons and the less than intuitive controls for formatting a disc, changing settings, etc... But for me it is so far the best compromise of size, cost and quality." Thanks to David Duncan of Lynchburg, Chet Rhodes of the washingtonpost.com and Will Yurman of Rochester for sharing their first impressions. Also see Andrew Devigal's mini-review at Interactive Narratives. I know I'll never ever go back to minidiscs.